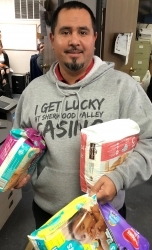 In an effort to help those who have lost everything due to the devastating Northern California fires, employees of Sherwood Valley Casino went into action over the weeks leading up to Thanksgiving Day, collecting cash, diapers, water and wet-wipes to aid those directly impacted by the Camp Fires. All donations were exclusively made by employees of the casino or tribal businesses. Willits, CA, December 04, 2018 --(PR.com)-- When the team members of Sherwood Valley Casino saw the news of the fires and devastation occurring to their neighbors in Paradise, California, they knew something needed to be done. In an effort to help those who have lost everything due to the fires, employees of Sherwood Valley Casino went into action over the weeks leading up to Thanksgiving Day, collecting cash, diapers, water and wet-wipes to aid those directly impacted by the Camp Fires. All donations were exclusively made by employees of the casino or tribal businesses, and a truck full of needed supplies were collected and taken to the area’s relief organizations. In addition, all cash donations by the staff and management were matched 100% by the casino and the Tribe. "When we saw how over 90% of the town of Paradise was gone, wiped off of the map by these horrible fires, and hundreds of evacuated residents were living in a makeshift camp in a parking lot in Chico, California, we knew we had to help," said Michael J. Broderick, General Manager. "It was a team effort, driven by the employees' desire to help those most in need. While donations of clothes and food were pouring in from around the country, basic hygiene items like diapers and water were still needed. So we decided to focus our efforts there. I couldn't be more proud of the efforts made by the team members, as well as our department team leaders." According to Broderick, all of the donations and a sizeable check were packaged and delivered by truck to the North Valley Community Foundation by the casino’s facility department. The Sherwood Valley Casino is gently nestled against a backdrop of the lush coastal forestry that forms the signature scenery of Willits, California, the heart of Mendocino County. Featuring over 220 of the newest and best slots, Sherwood Valley Casino is reputed to be "The Friendliest Little Casino in Mendocino County." Dedicated to providing our guests with an exceptional gaming and entertainment experience, Sherwood Valley Casino’s 6,000 square foot, action-packed gaming floor features the Creekside Café for a delicious bite to eat, the most generous players club in the area, and the friendliest customer service around. We are open 24/7, 365 days a year. For more information please call: (707) 459-7978 or visit us online at www.svrcasino.com. For more information on how you can help with the Camp Fire relief efforts, please contact the North Valley Community Foundation at https://www.nvcf.org.